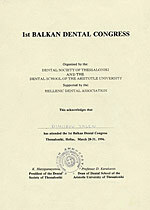 Member of Bulgarian Dental Association. 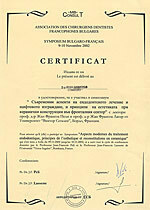 Member of Bulgarian Association of Oral Implantology. 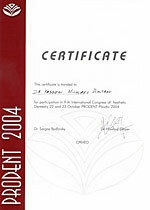 Member of ICOI (International Congress of Oral Implantology). 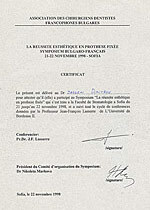 Member of SICOI (Societa Italiana di Cuirugia Orale e Implantologia). 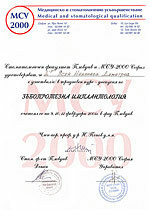 Member of Bulgarian Association of Aesthetic Dentistry. 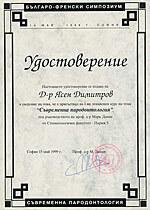 Graduated the Faculty of Dentistry in the Medical Academy - Sofia, Bulgaria. 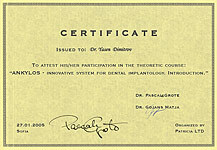 During his study Dr. Dimitrov was awarded the Dean`s scholarship for a student's contribution in the field of pediatric dentistry. One year course in Oral and Maxillo-Facial Surgery. Maxillo-Facial Surgery Hospital - Sofia, Bulgaria. 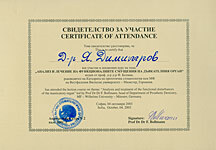 Lection course in analysis and treatment of the functional disturbances of the masticatory organ - Prof. Dr. F. Bollmann. Practical course in Maxillo-facial surgery and Implantology, led by Dr Fotios Tzerbos, Metropolitan Hospital - Athens, Greece. One year post graduate practical course in Prosthetics. Practical course in implantology, led by Dr. Stefan Ihde, Switzerland. Practical course in implantology, led by Dr. Werner Mander, Germany. Practical course "Immediate loading and computer-guided implantology" with Dr Matteo Danza, Pescara, Italy. Practical course "Guided bone regeneration and sinus lift" with Dr Francesco Vedove at Bassano del Grappa, Italy. At present his practice includes endodontics and cariology, dental surgery, prosthetic and aesthetic dentistry, oral implantology (intra-osseous as well as subperiostial). The practice is open from Monday till Friday from 9h till 19h. Appointments outside of normal working hours can be made by arrangement.